During a recent trip to India, a journey conducted with the prospects of a possible expansion of Sorosoro in this part of the world, I have been granted encounters with truly extraordinary characters, as one may come across in these immense and preciously paradoxical countries. 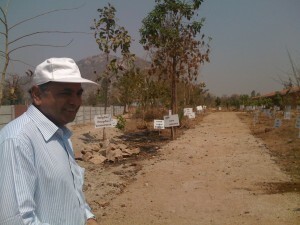 Graduate of Leeds University, former professor at Yale, Ganesh arrived in Gujarat in the 90s to teach at Boroda University. He was then struck with the linguistic barrier separating the Dravidian languages in the south and the Indo-Aryan languages in the north, in a transversal line stretching from Gujarat in the west all the way to Bengal in the eastern part of the country… and he took on to travel along this virtual line, to find out that a large number of “indigenous tribes” remaining unattached to the caste system (though omnipresent in India) are settled all over this strip of a few hundred kilometers wide. 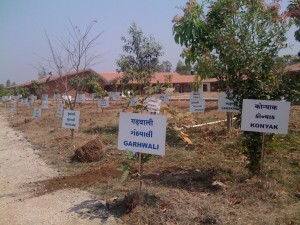 Ganesh Devy in Tejgadh, where the Adivasi Academy is established. Nowadays, the activities carried out in this “academy” are very diverse: there’s teaching of course, documentation on indigenous languages and cultures, editing and publishing, theatre, artistic and museological activities, but also handcraft, sustainable development, microcredit… And the outcome is mind-blowing: the young men and women who, 12 or 15 years ago would sit and chat with Ganesh under his tree, today hold key positions in the academy. The air here is filled with a sense of peace, serene joy, pleasure for togetherness, and pride in showing short-term visitors what has been accomplished: a genuine economic and cultural development center for native populations. A few trees in the forest of languages. 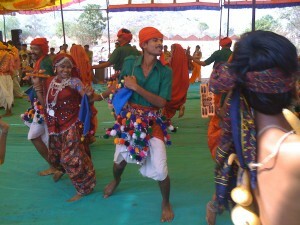 Tribal population dances at the Academy.